No Boundaries: How About Some Tuna? Tuna is good for you. Or turn it into a BLT. 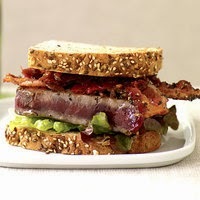 That's right - how about a Tuna BLT? Hang in there, let me run through it before you scream into the night! This recipe serves four. Or maybe two, if you're REALLY hungry! 1) Preheat your oven to 375. On a slotted broiler pan, bake the bacon until crisp. (Mmmmm, bacon) This will take 15-20 minutes. And if you are smart, you'll add a few extra slices for nibbling. 2) In a small saucepan, heat 1 tbsp. EVOO over medium high heat. Add the onion and garlic, cook until softened, about 7 minutes (smaller the dice the faster the cook). Season with S&P. Stir in 1/2 cup water, sun-dried tomatoes, vinegar, sugar and Worcestershire and bring to a boil. Lower the heat and simmer until thick, 7 to 8 minutes. 3) Season the tuna with grill seasoning. (Here's a hint, if you don't have grill seasoning - just do S&P. I have some smoked black salt, which worked really well, imparted some of that smoky grilled taste.) In a large skillet, heat the remaining EVOO over medium heat. Add the tuna and cook for 2 minutes each side for medium rare. 4) Toast the bread. Build with the lettuce, then tuna, bacon, and tomato jam. Now, enjoy! Add all these into a MEDIUM saucepan, bring it up to a boil, keep it there for about 5 minutes, then reduce the heat to simmer for another five minutes. I've got a photo here; it's not of the one we made, because, well, we ate them before we had a chance to think about photographing them. But, it gives you an idea. I hope you enjoy it - and as always, you have questions, shoot me a line!